It seems that life has a way to stuff a person into a box. This box is one that “everybody” is supposed to fit into. If you are like me you went to a school of the masses, was taught with the masses and expected to learn the masses. Only I didn’t. Being in college prep because you are good in English doesn’t mean that you are great at all of it. Math, Science, etc. In fact most of us aren’t great at all of it. In my opinion and there is science that backs up that there are right brainers and left brainers, but there are tons of articles and research. This post or this blog itself wont be discussing that stuff. 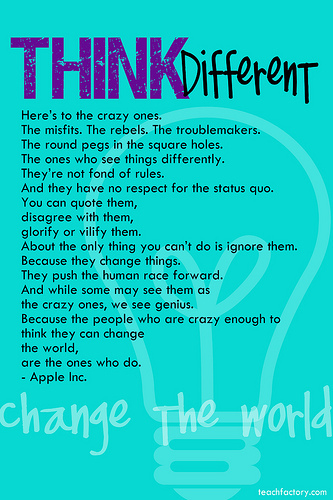 Steve Jobs made the Apple Company because he thought differently. He got fired a few times and people thought he was difficult to get along with most of the time. Why do you suppose that was? In my opinion it was because others were expecting him to excel with his creative mind in their rigid environment and it didn’t work. It didn’t work until they let him do it “his way.” Also in my opinion, he lacked interpersonal skills, persuasion, etc. It was easy for the “nay-sayers” to not think kindly of him when he refused to do things “their way,” especially when he knew they were wrong. As we all know know he was right and he made the whole world see things with “fresh eyes. If you are a creative thinker bear with those that aren’t. I realize that it is hard, but try. Realize that the whole system was designed by non-creatives because the “creative types” were creating rather than analyzing and building, making 1+1 = 2. Find your own fire and fan it, color your own world, sing your own song. As creatives you have had to develop the skills to “work around” things to get people to see things your way, to show them something they have never thought of before. So GO, be YOU because there is only one YOU to share, they are waiting (they may not even know it yet) but you will help make a better world. If you are a business owner, fine tuning is always helpful. It is easy to get stuck into the grind of it all. I know that I often get so immersed in the day to day of operating, making sure my software is updated, returning calls, networking, etc. I oftentimes get so wrapped up, I fail to think about my company as an outsider. Where I want it to go and what my part is in moving it in that direction. As a Marketer at heart, (been at it in one way or another for 30 odd years – yikes!). I love planning. Planning allows for contemplation of what has happened (or what we did), what we think is going to happen and what we plan to make the best of it. It also is the place in the company that gets everyone together to decide “What” and “Who” we are as a company and “What we WANT to be?” Those things don’t happen in Accounting, Sales or HR they happen in Marketing. I am fortunate that I teach Social Media as well as Marketing at Husson University at the New England School of Communications. I say that I am fortunate because for about 30 weeks a year I get to teach courses on things that Marketing people need to be doing at their companies. Sure I may have to pick up the mail and make a bank deposit, follow up on Sales calls or client requests, but I am constantly reminded of what needs to happen in Marketing. That I need to stay connected to that world, to the media in person, on air or through social media. There are a host of other things that I am reminded to do, because I teach these courses and the feedback from the students is priceless and very helpful to me. 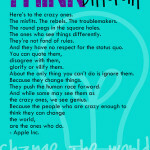 *thank you Creative Commons and Apple for the use of their image.